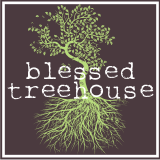 Blessed Treehouse: Handmade Photo Card in 60 seconds. I couldn't tell you the last time I bought a greeting card. For nearly every occasion, I will hand make the card. And now that I have children, most of the cards that I give feature them. Here is how you can hand make a photo card in only 60 seconds! To watch the demo only, fast-forward to minute 1:38. Stop spending money on cards. Your wallet and recipient(s) will thank you, I promise. Nice. I'm thinking of sending some thank-yous with Henry and Harper's pic on them. Is that tacky? Awesome! I love your hand made cards! i am trying to get more into doing things like that. I need to get a good paper cutter like that! Amy - You have no idea. Amy, Anytime - I have two!